Research and observation show that students want real-world learning that is meaningful to their lives and interests. We’ve seen what happens when students are able to work on issues about which they’re deeply passionate: They’re animated, in the flow, committed, creative. In IHE’s Solutionary Program, students apply their passion and compassion to develop meaningful solutions to problems they care about. But students may need help identifying what those global (and local) challenges are. Even as adults we continue to learn about new challenges facing people, animals, and the Earth. Guest speakers, field trips (virtual and in-person), video clips, and news stories are all useful tools for helping students learn about global ethical issues. 1. Do an activity such as: Finding Your Solutionary Path. 2. Investigate IHE’s global issues guides on our Pinterest page. 3. Explore the Stories of Solutionaries and Changemakers (via Pinterest) to see what challenges other people are addressing. 4. 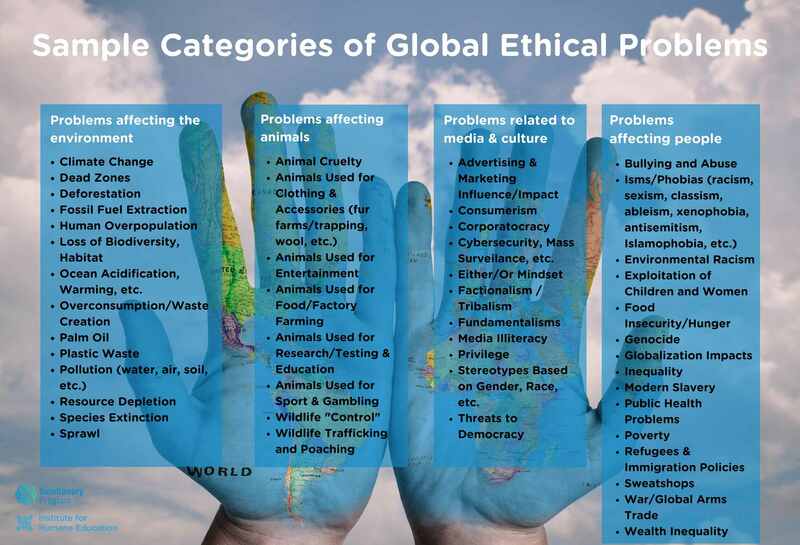 Discuss the Sample Categories of Global Ethical Problems chart with students, and do a little investigating to find out which problem(s) students may want to address. 5. Explore the UN’s Sustainable Development Goals. 6. Visit the Americans Who Tell the Truth online Portrait Gallery to find out about contemporary and historic people who have addressed pressing issues of their day. 7. Use 360°photography to do a virtual reality field trip. See Google Expeditions for a free app and free expeditions all over the world. Once students have broadened their knowledge about global ethical issues, they can reflect on which ones most resonate with them, while you help guide them in how to address these problems in ways that are developmentally appropriate and that fit within the constraints of the school year and curriculum. Find out more about IHE’s Solutionary Program.